What is a Supreme Council? Is the United Supreme Council different from other Scottish Rite Jurisdictions? What are the membership requirements of the Southern and Western Masonic Jurisdiction? How does Scottish Rite operate? What is the attitude of the Southern and Western Jurisdiction with respect to religion? What does it cost to take the Scottish Rite Degree? Are Scottish Rite degrees considered "higher" than other Masonic degrees? What is the degree structure of Scottish Rite? How long will it take me to become a 32nd Degree Freemason? Will I witness every Scottish Rite degree upon initiation? There are 29 degrees within the Scottish Rite, must I memorization every detail? When does the Scottish Rite hold meetings? What is the difference between the Scottish Rite and the York Rite? What is the Thirty-third Degree? Symbolic Masonry consists of three degrees; Entered Apprentice, Fellow Craft and Master Mason. These degrees make up the foundation on which all additional Masonic degrees are built. Refer to What is Freemasonry for additional information. Scottish Rite members of the 32nd degree meet in what is called a Consistory. Additionally, a Consistory of the 32nd degree normally preside over subordinate bodies including a Lodge of Perfection 14', Chapter of Rose Croix 18' and Council of Knights Kadosh 30'. A complete degree structure can be found here. Additional information regarding Consistories can be found here. A Valley is a town or city where Scottish Rite bodies are found. Scottish Rite Orients are states or a providence within a particular governed territory. Several Valleys reside within a specific Oriental State or Providence. The Ancient and Accepted Scottish Rite is governed by a council of thirty-three active and additional honorary thirty-third degree Freemasons. Honorary thirty-third degree members may address the floor but hold no vote. This council called a Supreme Council of the Thirty-third and Last Degree provides direction to all Orients and Valleys within its territories and dependencies. What is the Southern and Western Masonic Jurisdiction? The Southern and Western Masonic jurisdiction of the United Supreme Council consists of several states including California, Louisiana, Texas, Arizona, Mississippi, Georgia, and South Carolina among others. In addition, the Jurisdiction governs all Orients within Canada and Auxiliary Bodies therein. the world is the same. in additional to the basic Masonic tenants of Brotherhood, Relief and Truth. Membership into a Valley of the United Supreme Council requires that one be a Master Mason in good standing in his Symbolic "blue" Lodge. How does the Scottish rite operate? The Supreme Council of a Scottish Rite body governs all degrees from the 4th to the 33rd. Within each state, called an Orient, there exist several Valleys comprising of Consistories. Each Consistory governs itself within a local town or city. Although a Consistory establishes bylaws to aid in their government, this in no way supercedes laws mandated by the Supreme Council and/or the State Representative. There is very little stipulation regarding the religion of a Scottish Rite candidate. To have been made a member of the Freemasonic Order, one must have already expressed a belief of a Supreme Being. This is the case with the Scottish Rite. Every Scottish Rite member of different religious faith find themselves equals among their friends and brethren. What does it cost to take the Scottish Rite Degrees? Each Consistory establishes its own guidelines as to the fees for elevation. These fees may be used to cover expenses for regalia, patents and membership. Although the number of the degree itself is greater than that of the Symbolic and York Rite degrees, it is well understood that the degrees of the Scottish Rite are but enhancements of the Symbolic degrees. Universally, there are only three degrees in the Order of Freemasonry. As one acquires more degrees above the original three, he will also acquire a greater revelation as to the mysteries of the original three. The Degree Structure of the Ancient and Accepted Scottish Rite is separated into five branches. These branches are the Ineffable, Historical, Philosophical, Traditional and Chivalric and the Official branches (each referred to as "houses"). The following link Scottish Rite Degrees shows the Scottish Rite degree structure. Normally, when a petitioner seeks membership into the Scottish Rite, he receives the induction ceremony for each Degree. Within the United Supreme Council, the Valley who has the Lodge of Perfection, Rose Croix Chapter and Knights Kadosh properly working, requires their candidates to spend time in each house. 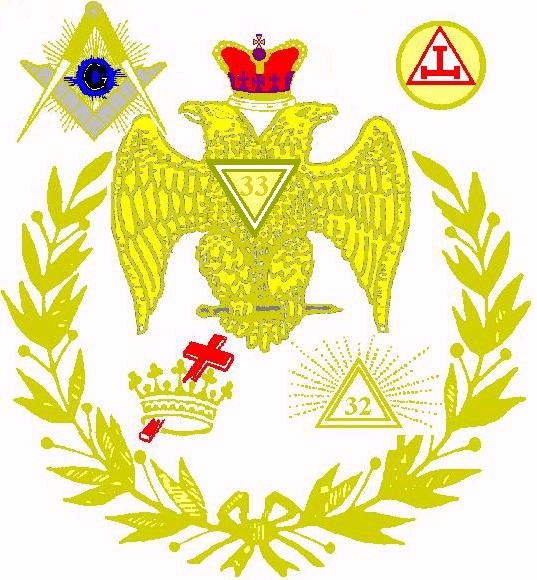 Other Supreme Councils may elevate a petitioner directly to the 32nd degree during a "Reunion" of Scottish Rite Valleys, Orients or the Supreme Council. It is hoped that every petitioner witnesses first hand all the Scottish Rite degrees, thus impressing upon the mind the significance of the Degree. Very little memorization is required as the Scottish Rite contains volumes of Masonic information. Just as a Master Mason is required to become familiar with the tenants of the Symbolic "blue" Lodge, a Scottish Rite member must also become familiar with basic Scottish Rite lecture. The Lodge of Perfection, Rose Croix Chapter, Knights Kadosh and Consistory have pre-determined times when meetings and functions are to be held. These times are usually once a quarter, however, this timetable may be shortened or extended as the body sees fit. Once a Master Mason of a regular (legally constituted) Symbolic lodge has felt that he has mastered all of its tenants, he may inquire as to the benefits and membership requires of either the Scottish Rite, the York Rite, or both. The York Rite, similiar to the Scottish Rite, add further explanation of the Symbolic Degrees. The primary difference between both rites is that of degree structure. One may find that several York Rite degrees are very similiar to that of the Scottish Rite. Both Rites, however, are designed to further increase ones knowledge of the Order of Freemasonry. The Thirty-third and Last Degree is awarded to Scottish Rite Freemasons who have shown great work in their society and/or the Order. One can not petition for this degree. The United Supreme Council has placed minimum requirements for awarding this degree including length of time within a Scottish Rite body, current age and community service performed. In addition to these requirements, a candidate is required to receive vouchment from several high ranking thirty-third degree Freemasons within his Orient. All candidates for this high and noble degree will be awarded such at the biennial session of the United Supreme Council. The United Supreme Council of Sovereign Grand Inspectors General of the Thirty-Third and Last Degree.